Store over 180LB of bumpers! Store over 360LB of bumpers! Designed for use exclusively with Rogue’s Infinity Series racks and squat stands*, each one of these durable 13” storage pins can hold over 180LB of bumpers or cast iron plates. Simply mount the Vertical Plate Storage channel to any 2" x 3” Infinity upright using the provided detent pin and you’re good to go. The pin set-up also makes it easy to quickly remove a storage post or change its position at your convenience. Rogue Vertical Plate Storage is available to order as a single or double unit. Single Plate Storage: (1) 13" long, 7-Gauge Steel pin with 180LB+ storage capacity. Double Plate Storage: (2) Connected 13" long, 7-gauge steel pins with 360LB+ storage capacity. Important: Due to its larger size, the Double Plate Storage unit can limit the range where J-cups can be adjusted. For this reason, we recommend using two separate Single Plate Storage pins if you’re adding storage to a power rack of squat stand. *Vertical Plate Storage is NOT recommended for the small S-1 Squat Stand, but IS compatible with the larger S-2 and S-3 stands. Rogue Infinity Vertical Plate Storage is rated 4.5 out of 5 by 8. Rated 4 out of 5 by ReviewRouge from Great for storing, bad for benching I purchased these to use on my S-1 Squat Stand. They are great for storing my bumpers, makes putting on & taking off 45s much easier. The downside is when you have weights on them, they get in the way when benching. If you have Safety Spotter Arms they can only go down so far because of the Vertical Plate Store. So I have to remove the weights, and the Vertical Plate Storage just so I can get the Safety Spotter Arms to the right height, very inconvenient (that's why 4 stars). Rated 5 out of 5 by Maykel Mendoza from Excellent Addition Like everything else Rogue sells, it is plain to see that Vertical Plate Storage is pure quality when pulling it out of the box. Even the pin is heavy duty. I bought a pair of these for my S2 Squat Stand, and I absolutely love them. I set them both up in just a few minutes, and I am currently storing a total of twelve forty five plates (six on each side) with room for more. I also love the added bonus of it bringing more stability to my S2 Stand. Its a really nice way of keeping the plates organized and ready to load. To say the least, the Vertical Plate Storage is hands down another great quality product by Rogue... Two thumbs up! Rated 4 out of 5 by John Berry from Just go with stationary storage instead if you're buying for an s-series stand with spotter arms. I got these to go with my s-2 squat stand specifically so I can take them on and off easily. 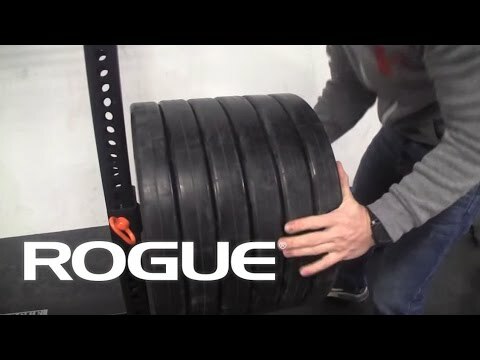 I wish I had just gotten these [[Plate Storage Long for infinity]] http://www.roguefitness.com/sp2358-plate-storage-long-for-infinity and mounted them at the lowest position possible on the side of the s-2. The S-2 with spotter arms and extra jcups simply do not have room to place these storage arms since they use the front holes rather than the sides like the others use. I'm sure these work great for rigs though where you have plenty of room to work with. Long story short, don't buy these to go on the s-2 squat stand. Rated 4 out of 5 by frances08 from Should have gotten a plate tree instead Have S-2 Squat Stand and these get in the way constantly. I'm 5'2" so where I need the J-cups for squats the bumpers get in the way, so I have to strip the top post of bumpers before I can load the bar. Also can't bench with this. I'd think about getting the HR-2 Conversion but I feel like I'm going to run into the same problem with the bumpers getting in the way. So if you're on the shorter end of things or want to bench & have a squat stand - just get the separate Vertical Plate Tree storage instead. Rated 4 out of 5 by David Whiting from Great product Great product, easy to install/uninstall. Holds a lot of weight without bending. Shipping was quick and I will be buying more products from Rogue. Only downfall that I have to say about this product is that I have to move them out of my way when it comes to bench pressing. I have the S-2 rack and the plate storage has my bumpers hitting each other when on the way down. If I would have had a cage it would have had better usage out of these plate storage holders. I should have invested in an upright bumper tree storage instead. Rated 5 out of 5 by Derek S from simple yet perfect These are super simple but yet perfect in design. I have two of them on my R-3 bolt together rack. They are really easy to move around to any location on the rack that I want. The 5/8" pin that holds it in place is super thick and strong. The entire plate storage assembly is nice and thick. It is also pretty long so you can put a lot of plates on here if you want. All in all, this thing is perfect. I wouldn't change anything about it. I'm very happy with my purchase. Rated 5 out of 5 by Chad Dickson from Fantastic Looked at lots of various plate storage options and finally settled on the double plate storage. Couldn't be happier. I'm buying another for the other side of my S-2 stand. Fantastic. Rated 5 out of 5 by David Zamora from Works I live these. I got four of them and love how strong and easy to move they are.